Wondered, that is, what life is like in suburban Cincinnati, Ohio? You are about to find out! Thanks, Blogtrotting readers, for stopping by for a visit! If you've been following along this week on the Blogtrotting tour, we've been to some pretty exotic places. While I can't claim any tropical views, there are many things I love about living in southwestern Ohio, and I hope you'll enjoy hearing about a few of them. I live in Loveland, on the northeastern side of the loop of highway that surrounds the city. As mep mentioned yesterday in the hint about where this tour would go next, people really do send their Valentines to our post office to be hand stamped with a special "Mailed with Love from Loveland" postmark by volunteers. I grew up just south of Dayton to our north, so I've been living in this section of the country my whole life. Word has it that Cincinnati and Dayton are poised to become one big city, like Dallas/Fort Worth, after this year's census, due to the suburban sprawl that extends north across I-75. Not sure that changes much of anything, as the two cities are both places known for their friendly people and down to earth Midwestern values. Many people have said it before me: this is a great place to raise a family. Pretty gorgeous, but I'm really fine with looking at it from my window, and will be fine when it decides to turn spring around here. In fact, one of my favorite things about living here is that we have four distinct seasons. I thought I'd share with you some of our favorite things to do in each season here in Cincinnati, all things we'd recommend you try if you visit, no matter the season. The very first time the weather starts to get warmer, we start hitting the parks. We actually live in a township, rather than the city proper, and it has an excellent parks and recreation department. There are camps and activities scheduled year round, and many well maintained parks with playgrounds to enjoy. We have a regular rotation of all the different play equipment and walking trails. There is also an amazing bike trail, made from the old railroad line that runs along the Little Miami river, including right through downtown Loveland. It's a great place to bike, walk, or push a stroller. We also really enjoy tromping around in the woods, looking for signs of emerging wildflowers and new life. Sometimes we explore the ones right in our yard, but when we want a little more room, we head to the Cincinnati Nature Center. It has tons of trails of varying difficulty, including a few that are stroller friendly. My kids especially love the pond filled with fish and frogs, where we almost always spot tadpoles in varying stages of metamorphosis. We can also feed turtles in another pond. There is a cool indoor area for birdwatching and learning about local wildlife, and the staff is always very kind and informative. The Nature Center has a small admission fee most days unless you are a member, but is free to the public every Monday. a strong collection of big cats as well. My kids have been following along on the news as our manatee friends were prepared to be released into the wild, and look forward to seeing some new ones arrive this spring. Here they are right outside the manatee's home, along with my cousin's little boy. Probably our favorite place to enjoy the fall colors is Sharon Woods park. There is a mile long loop through the woods and around a small lake, with an excellent playground near the parking area. You can also rent paddle boats, fish, or golf at this park. In the summer, there is a water play area for the kids. In the winter, (actually year round), you can find us at Cincinnati Museum Center at Union Terminal. It's a complex of three different museums plus an OmniMax theater all inside one of Cincinnati's greatest architectural treasures. Perhaps some of you who grew up watching Superfriends recognize it as the inspiration for the Hall of Justice?? Those are some of our family's favorite haunts, all places we would take visitors new to the city. And because food is also a topic near and dear to my heart, I feel obligated to tell you about some of our favorite Cincinnati treats. If you come to visit, I'll be sure to start you off with some lunch at Skyline chili. This is what Cincinnatians like to call chili, but to those not familiar, it would probably look more like a thick meat sauce served over spaghetti or on a coney. The secret ingredients are Middle Eastern spices like cinnamon, allspice and cocoa, but the end result, with neon orange shredded cheese, onions and/or beans and served with oyster crackers in a little bowl, is pure Cincinnati. We'd also swing by Dewey's Pizza for some excellent house salad and a gourmet pizza. My personal favorite is the Edgar Allan Poe with whole cloves of roasted garlic. For dessert, you must have a scoop or two of Graeter's ice cream. sorbet, and it is delicious. Other places we love to eat that are singularly Cincinnati include Montgomery Inn (ribs that may not win any "authentic" barbecue contests but are fall off the bone delicious) or Zip's Cafe (amazing burgers in a crowded fun atmosphere), and when we're feeling fancy, a restaurant owned by either Jeff Ruby or David Falk. Those of you really looking for the suburban experience, there is also a small circle of family friendly places we frequent in our very own Loveland on Friday nights: Shooter's, Paxton's, The Works, and (for the best fajitas in town) El Picante. When we have a night without the kids, my husband and I often return to the place we met, Crowley's Bar in the lovely hilltop neighborhood of Mt. Adams (proof that not all of Ohio is flat farmland!). We also have been known to take in a show at Playhouse in the Park, and are season ticket holders for Xavier University's basketball team. Go Muskies! There is so much more I could share about what I love about living in the Cincinnati area, but I fear I've already surpassed my 500 word goal. I hope you enjoyed the little tour, and hope you'll leave me a comment to tell me from where you are visiting! 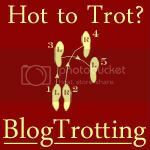 While you're at it, if you haven't signed up to be a tour guide yourself, head on over to Blogtrotting right now! *Recognize the beginning of the lyrics from WKRP in Cincinnati? Several years ago, my brother was dating a girl who lived in NYC. When she told her friends she was going to Cincinnati to visit him, the only reference they had was the theme song to this show. While I'm a fan of the show, and I'm aware that Cincinnati is not exactly a world power, this seems really strange to me. Thank goodness he ended up with a Midwestern girl instead. I have to confess that I've never been to Cincinnati and the first thing that pops into my mind when I think of it is WKRP. I loved that show, never mind that I'm pretty sure it was wildly inappropriate for a 7 year old to be watching it. I remember one episode where Johnny Fever had to outdrink a DUI cop. Pure awesome. At my last job, one of the principals was a U of C grad and we had co-ops come to work for us each semester. So I got to know a number of young Cincinnatians (is that what they're called?) and they were a lovely bunch of kids. GREAT POST! Those museums sound like an amazing way to spend an day or ten. I'm officially welled up as I wish so badly that I enjoyed all four seasons in Cincinnati, instead of a few days here and there in each. You did such justice to the most wonderful place in the world to live and raise a family! Miss Cincy. Miss Skyline. Miss Graeters. Miss going to Xavier games. Wonderful! You captured our great part of the world! We wouldn't live anywhere else! The best part of it is, our grandkids are part of this world. M.
LOVE LOVE LOVE this post! We just discovered the Cincinnati Nature Center and Shaw Farms a couple of years ago, and my kids love them! You are so right; we are blessed to be raising our kids in such a great place! You did Cincinnati proud, E! Now I'm headed over to your post office to get my envelopes stamped. Can you believe I didn't know that about Loveland? I have never been to Cincinnati, but now I really want to visit. It sounds like a marvelous place. And I love the pics of your babies. Thanks for the tour and all the great information about your corner of this world, you did a great job. Fun tour! That walking path looks fabulous! I really want to visit Cincinnati really bad!! My daughter went through there this past summer on a road trip and loved it there. I, too think of WKRP when I hear the word Cincinnati. inside i roll my eyes and then i try to explain the difference. haha. i'd like to visit ohio someday though, and i really enjoyed your post. sounds like there are lots of things to do there! I am with MEP, reading this makes me miss my home city A LOT! Thanks for taking me there briefly. Also, I am a lime sorbet too! As a Cincy resident from the other side of town, i enjoyed seeing what things you chose to mention. Well summarized. I will be following up on the apple orchard link as I have been wanting to find a place to go the past couple autumns. I will mention that we are season pass holders at kings island (even though it is closer to you) and definitely get our money's worth...great waterpark and nice kiddieland area for the rides. i love skyline chili. we live up in cleveland, and have only driven trough cincy. but looks like a fab place! our oldest drove down there with his youth group to visit the creation museum. there's also a dewey's pizza that just opened up here so i'm excited to try it out :). I live near cleveland too. We've been to Cincy a couple times while visiting King's Island. Looks like a beautiful city! Never been there, either! Would love to visit you if I ever get there!